A U.S. Air Force wing flying the F-22 Raptor stealth fighter has devised a new strategy for using its high-flying, super-fast, radar-evading warplanes. By splitting its 40 F-22s into elusive, four-apiece “Rapid Raptor Packages,” the 3rd Wing at Joint Base Elmendorf-Richardson in Alaska apparently hopes to sidestep one of the biggest threats to American air power in the Pacific: China’s arsenal of long-range ballistic missiles, primed to hammer American airfields in the event of a major war. Wing officers unveiled the Rapid Raptor Package initiative to Air Force Chief of Staff Gen. Mark Welsh during Welsh’s visit to the Alaska air base in August. Air Force magazine reporter Marc Vincent Schanz was the first to report on the effort. A Rapid Raptor Package normally includes four of the twin-engine F-22s plus a single C-17 airlifter, of which the 3rd Wing has eight. The massive, four-engine C-17 carries all the maintenance personnel, weapons and spare parts that the four Raptors would need to fly and fight from a remote Pacific airstrip. According to Schanz, the packages are “scalable,” meaning more F-22s could be joined to the C-17 or two or more packages could be combined. “You can move them together, quickly,” Pacific Air Forces Commander Gen. Hawk Carlisle told Schanz. The fighters in a package are supposed to be able to move, get ready and begin fighting within 24 hours. 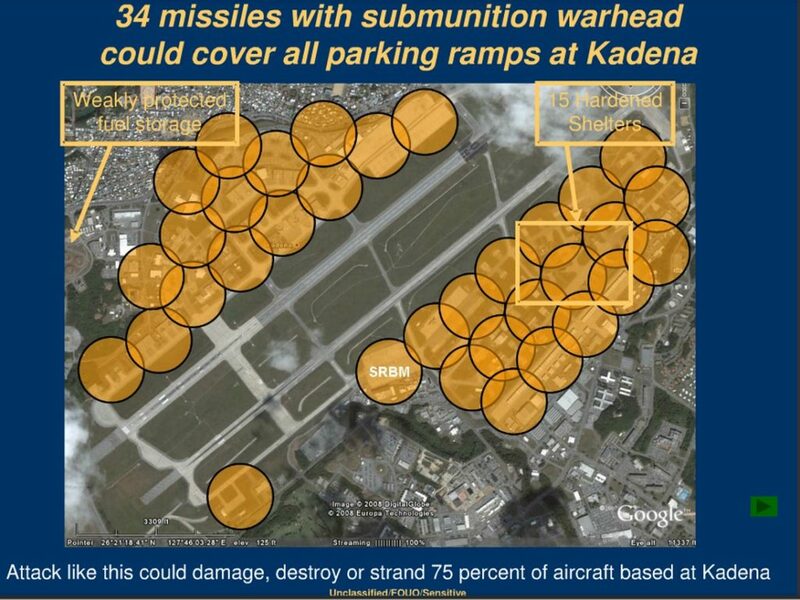 The Air Force began laying the groundwork for the packages several years ago, after a war game conducted by the California think-tank RAND in 2008 revealed the devastating effect China’s hundreds of ballistic missiles could have on Kadena in Japan, America’s main Pacific air base. During wartime, Kadena is expected to house hundreds of U.S. warplanes including the bulk of the 180-strong Raptor fleet, putting them within range of the Chinese coast. China knows this and has targeted the base accordingly. RAND’s war game concluded that just 34 missiles—a fraction of Beijing’s arsenal—could disable Kadena and “damage, destroy or strand 75 percent of aircraft” there. In an instant, America’s $75 billion investment in F-22s could be wiped out. So the Air Force renewed alliances with Australia, The Philippines and Vietnam in order to give its planes access to those countries’ bases. The Pentagon is building a new airstrip in the Marianas. Airfields in Thailand have also been mentioned as possibilities. The new basing deals opened up the infrastructure; the Rapid Raptor Packages—potentially 40 or more of them if all America’s F-22s were divided up—could provide the planes. Where once almost all of America’s air power in the Pacific would be crowded onto one base, now it can be spread out, making it harder for China to destroy it. If there’s a downside, it’s the fundamental military tenet of concentration. The F-22s might be based across a huge swathe of the Pacific, but to fight effectively they would need to come together in large numbers. Drawing together widely dispersed jets poses a huge command-and-control problem—one requiring delicate coordination. That coordination could prove difficult under Chinese missile barrages.